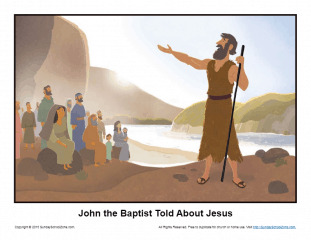 The story of John the Baptist Told About Jesus , found in Mark 1 and Luke 3, helps children to understand how God sent the message of Jesus to certain men before Jesus began his ministry. John fulfilled prophecies when he preached about Jesus. This illustration shows John preaching in the wilderness telling people about Jesus. It can be used as part of a Bible teaching session or as part of a children’s sermon.